With thanks to my tutor throughout this research project, Simon Baker of Sheffield School of Architecture. “An apparently homogenous collection of high-income professional people had split into three distinct and hostile camps. The old social subdivisions, based on power, capital and self-interest, had reasserted themselves here as anywhere else”1 J.G Ballard, High-Rise (1975) Anthony Royal, the architect of J.G Ballard’s ‘High-Rise’, stands at the window of his penthouse apartment, musing over the social disintegration spreading through the high-rise beneath him (Fig 1). A figure of Corbusian inspiration, Royal’s luxury high-rise shares the ‘radiant city’ ideals of modernism, albeit instead of social housing tenants, the residents of the high-rise are affluent, intelligent, bored and listless.2 Removed from the imperfections of the outside world and nurtured within the concrete structure of the high-rise, the residents live in a state of monotonous utopia - until the building, their life-line, falters and the carefully maintained social hierarchy descends into mayhem and tribal violence. A prescient work of social fiction, J.G.Ballard’s 1975 novel ‘High-Rise’ serves as an extreme metaphor for the dangers of privatisation and the rationalisation of urban development. Written as a response to the growing number of high-rise projects in Greater London, and perhaps with even greater relevance today, the novel emphasises the excessive rationality of private development, where the balance of social capital, equality and inclusivity are often overlooked in favour of rational concepts such as controllability, efficiency and profitability. control, can be seen to permeate urban development in Britain in the 21st century. Take a look at any current affairs newspaper or online magazine and you will inevitably find headlines referencing the ‘British housing crisis’ currently gripping the country (Fig 2). The owner occupied sector represents 63% of all households in the UK today, however half of these households (51%) are classed as under-occupied.4 This means that over one quarter of all households in the UK today are classed as under-occupied. Pair this with the fact that private enterprise developments represented 82% of UK housing development in 2017,5 and we are presented with an urban development model which seems alarmingly out-of-touch with the needs of current society. It seems clear from these figures that the rise of McDonaldization has had a detrimental effect on the relevance and social agency of urban development in the UK. 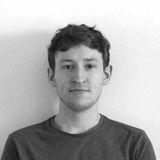 This research project will explore urban development policy in the context of contemporary society, questioning the widespread approach of rationalised efficiency in favour of alternative urban strategies which take an approach of â&#x20AC;&#x2DC;rational-irrationalityâ&#x20AC;&#x2122; - the ability to balance rational thought with a receptiveness towards change and surprise. Through the analysis of case studies and urban design theory both past and present, this study will explore their physical outputs and most importantly, analyse their organisational frameworks, design processes and relationships with authority in order to explore whether these strategies of rationalirrationality can be implemented as a counter to rationalised development in the UK. Modern cities are removed from the context in which traditional approaches were developed, a case in point being Venturi and Scott-Brown’s 1972 investigation ‘Learning from Las Vegas’, which was spurred by the realisation that current forms of urban analysis were not applicable to the characteristics of modern cities. The 2018 ‘Garden Communities’ prospectus recently issued by the Ministry of Housing, welcoming a return to the Garden City ideals first established by Ebenezer Howard in 1898, indicates that the planning of our urban environment is still preoccupied with the traditional arrangement of space (Fig 3). In her 1961 book ‘The Life and Death of Great American Cities’, Jane Jacobs laments that “as long as city planners… cling to the unexamined assumptions that they are dealing with a problem in the physical sciences, city planning cannot possibly progress”;11 over 50 years later, it would seem that these lessons have not yet made their way into the mainstream consciousness of governmental urban strategy. It is important to clarify that ‘urban development’, refers not only to urban design in the traditional sense, but all elements which together form our urban environment. Peter Barber presents this idea quite succinctly through his belief that “when we design urban housing we are designing cities”.6 Housing makes up 70% of all the buildings in London, the consistent element which lines our streets and defines the edges of our squares;7 therefore, our urban development policy should not limit itself by referring specifically to social housing or public space planning, but rather have a more holistic appreciation to the ‘organised complexity’ of our towns and cities. spaces where visitors are merely tolerated as opposed to openly welcomed. If we compare the management of a fast food outlet with the management of a public square startling similarities can be witnessed. Any given fastfood chain is hugely reliant on the consumer, however the interiors of the restaurant (and the drive-through concept) are often clinical and uncomfortable, encouraging consumers to eat their meal and quickly leave, in order to avoid any anti-social behaviour occurring and to keep the flow of sales flowing; in the case of the drive-through, a customer does not stop at all.16 Whilst the chain is reliant on the consumer, it merely tolerates them. The same principle can be seen in the private control of our public spaces, with anti-homeless features, banned activities, ‘no loitering’ signs and gated access (to name a few) being increasingly present control measures implemented to ensure the smooth operation of the space (Fig 5). In the modern neoliberal city, you no longer inhabit public space as a citizen, but as a consumer. This essay is not intended as an attack on the capitalist systems of UK governance and nor should McDonaldization be villainised as a thoroughly negative force; as Ritzer acknowledges, rationalized spaces are often hives of life which people willingly flock to and enjoy in huge numbers.13 Employing the term ‘Islands of the Living Dead’, Ritzer applies his theory to the realm of social geography in order to visualise McDonaldization as an archipelago of rationalised settings which are dispersed throughout our urban environment. Identified as shopping malls, fast food restaurants and entertainment parks, these islands of rationalisation can be identified as both ‘living’ and ‘dead’. They are alive, as these islands are often thriving places of consumerism, offering entertainment and leisure in a predictable, safe and comfortable setting. However, these islands can simultaneously be seen as ‘dead’ spaces, free from any of the risk which makes everyday life vibrant and stimulating (Fig 4). As a result of this pursuit of rationalised perfection, extended time spent dwelling within these islands can become at best dull, repetitive and predictable,14 and at worst oppressive, segregatory and discriminative. to McDonaldization, an example of ‘rationalirrationality’ which has the potential to negate the harmful side effects of urban rationalisation. 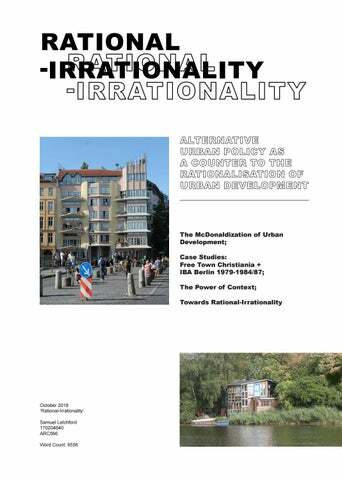 However, the fundamental issue still remains; how do we introduce this sense of rationalirrationality to mainstream urban development? In order to investigate this question, during the summer of 2018 a number of European urban development projects were visited and explored, all of which were delivered through alternative development strategies which supported an irrational approach (Fig 7). The following sections will explore a series of these case studies, analysing how these projects demonstrate ‘rationalirrationality’ in their organisational frameworks, in order to explore whether similar principles could be applied to a modern UK context. At first glance, Free Town Christiania appears to be a physical example of ‘autonomy’ in its purest sense, a self-governed community free from external control or influence. This suggests Christiania as an extreme example of ‘rational-irrationality’, fully removed from the capitalistic values of McDonaldization. However, as discovered upon visiting the Free Town and supported by extended reading on the topic, ‘autonomy’ is not necessarily a “synonym for independence and selfreliance”,23 as autonomous communities such as Christiania are ultimately reliant on the capitalistic systems operating at their periphery. Despite the largely self-managed structure of the Free Town, the community is dependant on the City of Copenhagen for electricity and water supplies alongside dwelling permissions, primarily stemming from a 1972 agreement with the Danish municipality. What makes Christiania interesting therefore, is how an autonomous community mindset coexists alongside the capitalist government of Copenhagen, in an irregular and often selfcontradictory relationship. This constantly evolving relationship and the subsequent impact on the infrastructural framework of Christiana offers an insight as to how irrationality and neoliberal governance can operate side by side in a modern societal context. creating a self-sustaining environment which allows these initiatives to be driven by a social responsibility as opposed to market value. The ‘common purse’ covers locally managed services such as rubbish collection, recycling, street cleaning, building renovation, public saunas, toilets and showers, a kindergarten and a youth club amongst others (Fig 11).25 Of particular relevance to my study is the ‘building assistance programme’, which supports and assists in the resident-led development of the urban environment, producing the unique architectural creations for which Christiania is famous (Fig 12,13). This results in a huge variation of urban projects, exemplifying the perspective that “participation should not be perceived as a gift to residents, but as a right.”26 This engagement between resident and urban fabric instills a sense of eroticism into the Free Town environment, compounded by the diversity of the Free Town population. As a result of the liberal attitudes of Christiania, the community has accumulated a wide range of inhabitants since its creation, ranging from young professionals and families to more vulnerable groups such as the homeless or those with addictions who are typically oppressed in neoliberal society.27 The eroticism of Christiania therefore emerges from this diverse mix, with each individual able to leave their mark on the physical and social environment of the Free Town (Fig 14 - 18). There is therefore an increased risk that these ‘investors’ will not share the autonomous mindset, and will most likely possess greater personal wealth than the majority of the population. If allowed to escalate, this influx of ‘normal’ individuals of higher social capital could push the vulnerable groups out and result in a ‘smoothening’ of Christiania, diluting the irrational spirit of the Free Town. In turn, the ability for participatory engagement of residents in their urban development could be directly impacted by this homogenisation. The introduction of individuals who do not share the values of Christiania could pose a roadblock for residents wishing to embark on construction projects, more likely to face vocal opposition to design choices and thus adding a level of discouraging bureaucracy to the system and possibly limiting the creative expression and eroticism of architectural creations. product as per rational development, but providing a social service which enables the participatory engagement of residents in the shaping of their own neighbourhood. However, it can be suggested that the capacity for Christiania to express this social agency has become somewhat limited in recent years, as the relationship between the community and local governance continues to evolve - an agreement signed in 2012 has been a particular cause of contention. A primary element of the agreement granted “inhabitants of Christiania to buy collectively most of the land on which they live at the price of about 76 million kroner (14 million euro), to be paid half in 2012 and half before 2018”,32 with the historical ramparts protected by Danish heritage being rented for a lease of 30 years. This means that whilst Free Town residents now legally occupy the land on which they live, relieving pressure from the government, as a consequence ownership and thus privatisation has now been introduced into the community. These issues originate in the political and circumstantial positioning of Christiania as an ‘opposition’ to local neoliberal governance. Whilst positioning themselves as an ‘alternative’ community has given Christiania the freedom to develop various policies of ‘rationalirrationality’, it is this separation which becomes a detriment to the transformative potential of the Free Town’s social agency. Transformative agency as defined by Anthony Giddens can be understood as ‘action that affects social change’,35 and thus by practicing agency within an isolated setting instead of an established social environment, the ability for the irrational policies of Christiania to instigate social change is severely limited, only benefitting the inhabitants of the Free Town itself. The critique of rationality expressed by Christiania therefore demonstrates critique as a force acting upon a system, operating from the outside - perhaps in order to become truly transformative, this critique needs to come instead from within mainstream neoliberal society itself (Fig 19). “Disneyfication is one of the biggest threats. Now it’s legal for everybody, you don’t need to be a little quirky to go to Christiania”33 (Activist, 25th July 2012) “If you are not interested in Christiania it’s actually harmful to Christiania if you live there and only consider it as a place to live”34 (Activist 30th July 2012) This introduction of private ownership is a contentious issue with residents, as evidenced in the above comments. The concerns expressed refer primarily towards the gentrification, homogenisation and commodification of Christiania. The privatisation of Christiania land opens the potential for outside investment, leading the community down a dangerous road which could lead to the rationalization of the Free Town. Beforehand, those wishing to live in Christiania were required to directly participate in the community, whereas the recent agreement offers external individuals an easy way to ‘buy their way into’ the community. An exemplary showcase of modernist urban development, IBA Interbau focused on one-off architectural wonders and their corresponding figurehead architects as the stars of the show, ‘an architectural display for the sake of architecture’ if you will (Fig 22). Typical of the modernist attitudes against which Jane Jacobs pitted her theory of organised complexity, and in line with traditional urban theory, IBA Interbau 57’ focused on the physical realm in an effort to create a new vision for Berlin, offering plenty of high-quality architecture but failing to address the broken city fabric and social disarray of Berlin in the wake of the second world war. network of four-lane ring roads and stacked interchanges over the existing fabric of the city, resulting in twenty years of demolition and aggressive urban development.40 Witness to widespread displacement due to the destruction of city blocks, the community of Kreuzberg was a diverse mix of squatters, young entrepreneurs, students, adolescents, retirees and immigrants, consistently under the threat of eviction.41 A spirit of activism emerged from this diverse community in order to challenge destructive development and in the 1970’s a squatters movement exploded across the capital city. This potent mix of social groups, all with varying social capital, represented an organisational structure naturally built upon the concept of ‘organised complexity’ and ‘social differentiation’, a complex community with individual beliefs and requirements, simultaneously participating in acts of activism in order to contribute towards a shared objective. ‘The Power of Context’ refers to one of journalist Malcolm Gladwell’s ‘Three Rules of Epidemics’, which states that the ‘tipping point’ or start of an epidemic happens as a result of some change occuring “in one (or two or three) of those areas”.49 In a twist of the traditional definition, an epidemic can be understood for the context of this study as a widespread occurrence of an infectious idea or trend, which spreads to permeate an entire community. The power of context primarily concerns the theory that “human beings are a lot more sensitive to their environment than they may seem”.50 Human behaviour is unconsciously sensitive to the details of our surroundings, responding to the social, political, economical and religious context of our daily lives. If an idea relates to these contextual factors, it can have a far greater impact and contribute towards the eventual ‘tipping point’. IBA Altbau, and the subsequent institutionalisation of the 12 Principles of Cautious Urban Development can thus be seen as the ‘tipping point’ of urban participation, creating an ‘epidemic’ which has influenced urban policy in Berlin ever since. architects were employed by the public sector whereas today less than 9% of architects are working on public sector projects.56 The overall success of these individual social housing projects is debatable, however they represent an undeniable visionary optimism, attention towards social responsibility and an embracing of risk which is lacking as a result of the McDonaldization of modern urban development. Therefore, there is reason to suggest that the current climate of the UK housing sector represents a new tipping point, signifying the moment at which alternative theory is best positioned to challenge the established rationality of urban development. This study has thus far established rationalirrationality and its connotations of eroticism, organised complexity and spatial agency as an antidote to the McDonaldization of urban development, offering the opportunity for transformative change within the frameworks of neoliberal society, at a pivotal moment or ‘tipping point’ in time. This concluding chapter will gather the findings thus far, in order to suggest how ‘the capability of acting otherwise’ may be implemented in practice. In the case of the Instandsetzung and Hardt Hämer in the run-up to the 1987 IBA Berlin, to create urban development which was critical and socially engaged, it was necessary to acknowledge and express internal critique towards the infrastructural framework of power within which they operated (Fig 37). This required a rethink of the role of the architect, abandoning the ‘Fountainhead esque’ myth of the sole genius57 and instead considering the architect as one social agent amongst many in the pursuit of spatial agency, as demonstrated in the social urbanism of Free Town Christiania (Fig 38). The output which a policy of rationalirrationality may produce, and the direction in which ‘acting otherwise’ may lead are intimately linked to context, due to the fact that “spatial agents work with a situated approach, in which ‘context’ is core to prioritising the human needs of any specific place”.58 It is therefore impossible to propose a specific set of principles as a ‘one size fits all’ solution to the issues of McDonaldization; like the 12 Principles of Cautious Urban Renewal, remedies are intimately connected to their founding context and thus unable to be applied to a new setting without losing some of their original transformative power. Public Practice, a London based social enterprise founded by Finn Williams and Pooja Agrawal, can be seen as a potential platform through which to make these aspirations a reality. Public Practice acts as a broker, ‘placing built environment experts within forwardthinking public authorities’ in order to improve the public sector’s capacity for proactive planning.61 Through the placing of design professionals within governmental frameworks, the ability for system-immanent critique could be maximised, therefore providing the opportunity to instill the mindset of spatial agency and ‘the capability of acting otherwise’ into the higher frameworks of urban policy. The importance of locality subsequently increases the importance of devolution, favouring area specific policy as opposed to the nationwide blanket solution recently proposed by the Ministry of Housing’s ‘Garden Communities’ prospectus. In this context, local governmental bodies such as local authorities and city councils are of increased importance, having better ties to the locality and thus being in the position to implement urban policy rooted in context. Local governance has the opportunity to become one of the many social agents working to deliver socially responsible urban development, focused on the creative evaluation of the frameworks through which projects are processed, as opposed to the physical delivery of projects. This suggests a change from traditional ‘placemaking’ policy; instead of dealing in the physical realm of ‘place’, which can exert topdown control and risks permeating the singular vision of the ‘smooth city’, it is far more liberating to deal with the social realm and pursue a policy of what can be called ‘condition-making’. Explored in his work on ‘game urbanism’, Hans Venhuizen considers spatial planning as a game, which should strike a balance between the “game side of seriousness, and the serious side of game playing”.59 As opposed to deterministic, ‘game urbanism’ is responsive and fluid, with the urban designer taking the role of games master, overseeing the game of participation without dictating the outcome. Game urbanism is therefore a creative form of ‘condition making’, where the architect or planning officer becomes a guide and enabler, shaping the frameworks through which urban developments are formed in order to ensure social inclusion and engagement is central to the process.